One of the world’s most unique events, La Fête du Citron (the Lemon Festival) is held every year in the town of Menton on the French Riviera. The area has become famous for this colourful festival, which now attracts in excess of 230,000 visitors each year. Held for two weeks, the Lemon Festival features floral processions, citrus-themed floats, confetti, dancers and folk groups, requiring over 140 tonnes of oranges and lemons. 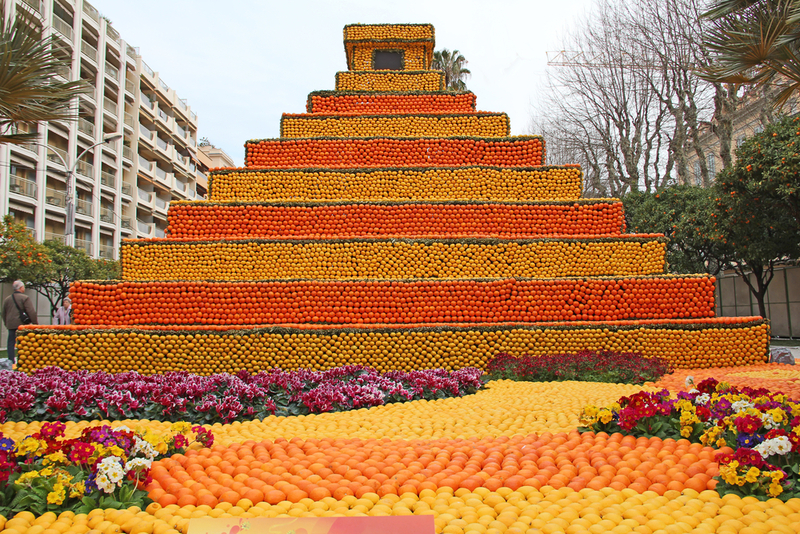 During the festival, the Biovès Gardens are adorned with citrus fruit, forming temporary sculptures in dazzling yellow and orange shades. Some can even reach heights of ten metres or more. At nightfall, the orange and lemon monuments sparkle in their flamboyant colours. This fantasy world is like no other and is truly a scene not to be missed. The Lemon Festival was born in 1934, the brainchild of a local hotel owner. The first event was, naturally, a much smaller affair. Held in the Biovès gardens, it included floats clad with lemons and oranges, street animations, night parades, and the Gardens of Light. Menton is one of the warmest towns on the French Riviera and is nicknamed la perle de la France (the Pearl of France). The area is famous for its exquisite gardens, including the Jardin Serre de la Madone, the Jardin botanique exotique de Menton, the Fontana Rosa, the Maria Serena garden, and the modernist gardens of Les Colombières. Menton is considered one of the French Riviera’s sleepiest towns, offering its own unique style that is often considered a breath of fresh air in comparison to the celebrity haunts of Saint-Tropez, Cannes, Nice or Monte Carlo. In recent years the area has been particularly popular among foodies, with dishes serving some of the most exquisite tastes and flavours to be had. Regional dishes to look out for include barbajuan – which is similar to ravioli – and socca, chickpea pancakes. In addition, you’ll also find pichade, a tomato tart speciality. For a trip that offers the stunning sights of the French Riviera and a much more laid-back atmosphere, Menton truly is the perfect location.